The South Fraser Blog: Sign up for Metro Conversations 1: Does the rise of short-term rentals help or hurt our cities? 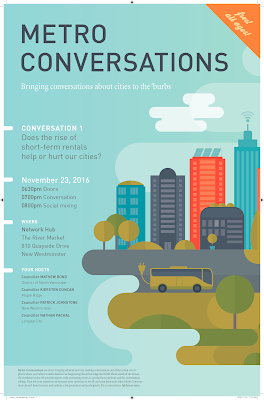 Sign up for Metro Conversations 1: Does the rise of short-term rentals help or hurt our cities? Earlier this week, I posted about a new series of urban-issues conversations that Councillor Mathew Bond from the District of North Vancouver, Kiersten Duncan from Maple Ridge, Patrick Johnstone from New Westminster, and I are hosting. These conversations are modeled after SFU City Conversations. Over the coming year, we hope to host conversations in the District of North Vancouver, Langley City, and Maple Ridge. Today, I wanted to share some more information about the conversation that is taking place next Wednesday in New Westminster. Does the rise of short-term rentals help or hurt our cities? Seating is limited, so while attendance is free and open, we recommend that you reserve your seat.